Whether teeth are lost to an accident, disease or have been missing since birth, dental implants are the next best thing to natural teeth. 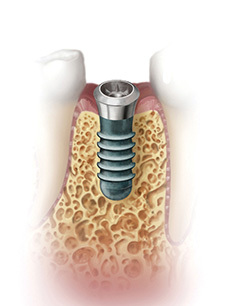 A dental implant is placed in the jaw to replace the missing tooth root. It acts as a base or an anchor for individual crowns, multi-tooth bridges and entire dental prostheses. 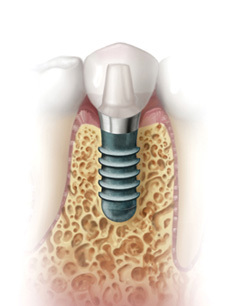 Implants look and feel most like your natural teeth, and can help prevent bone loss and protect adjacent teeth. And the benefits don't stop there. The specialist will place the implant and form the gum tissue around the implant. The bone around the implant should grow and integrate with the implant surface in just a few weeks. If the implant is in a visible area, a temporary tooth restoration may be placed while the site heals. When healing is complete, your restoring dentist will place the abutment, a small piece that connects the implant to the crown. An impression will be taken and the final crown will be ordered from the lab. When the final crown is returned from the lab, the temporary tooth will be removed and the final crown will be put into place. Virtually any adult with missing teeth may benefit from dental implants, as long as the jaw has stopped growing (which is why they are not appropriate for children) and there are no underlying medical risk factors. WILL I NEED TO GO INTO THE HOSPITAL FOR THE PROCEDURE? Most procedures do not require a hospital visit and can be performed in a dental office. The procedure is usually performed under local anesthesia to minimize discomfort. 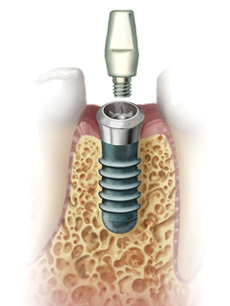 Insurance coverage of implant treatment depends on the individual policy. Many plans provide coverage for at least part of the implant therapy. It is best to check with your insurance provider to learn details of your benefit.